Start by chilling your glass. Either pop it in the freezer or fill it with ice cubes. Next, add all the Ingredients to your Mixing-Glass. Add ice and stir for a full minute. Your mixing-glass will be well-frosted. Discard the ice from your chilled Martini Glass and strain in your cocktail. 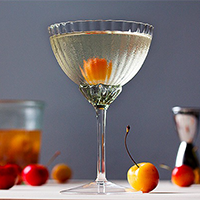 Garnish with a brandied Rainier Cherry. Brandied Cherries take a little while to make. Don’t worry, you can enjoy the cocktail in the meantime with fresh cherries (pitted). And that’s all there is to it . . .
A beautifully refined cocktail made from one of summer’s greatest bounties.